That really was a shocker from Garth George during the week. Full of misrepresentation, that unfortunately gets picked up as gospel. I sent the letter below and it was printed yesterday. Don Brash also wrote a response which I am lifting from Home Paddock. 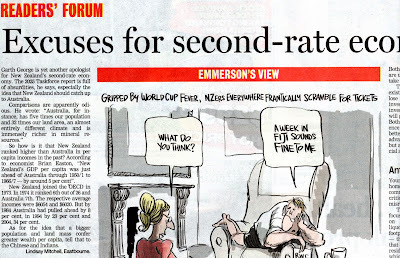 Let's hope the NZ Herald has the integrity to publish it. Here's a quick sketch I've just done for the Xmas Card this year. Robert says, But Jeffrey is purple and Palangi is yellow. True. But black and white is so boring. And nothing is ever black and white. Really. What is Law and Order coming to. Counties Manukau Police say there are some practical tips that will assist everyone to have a calm, happy and safe Merry Family Christmas and New Year.  Set aside money to cover bills in January and February.  Don't spend more on Christmas than you can afford. Christmas can be about spending time together as a family, not about buying expensive presents.  Moderate your alcohol consumption. You don't need to drink to excess to have a good time.  Don't drink and drive. Arrange for transport home prior to going out or appoint a sober driver.  If you share custody of children, come to an agreement before Christmas so that children get to spend time with each of you.  Problems can be resolved without arguments.  Take time out. If things become heated or stressful, go somewhere for a few hours to let things calm down.  If you are feeling afraid or overwhelmed, talk to someone you trust.  If you want help to avoid or prevent family violence, contact an appropriate agency. Some are listed below.  Most importantly, if you have any fears for your own or your children's safety, contact the Police immediately. British politics - tragedy or comedy? The wife of the Commons Speaker wants to run for Parliament. He was a Tory MP before becoming speaker but she wants to run for Labour. Anyway, in anticipation, she figured she would get the skeletons out of her cupboard herself. What a riot. Sally Bercow, 40, described her battle with drink, her fetish for one night stands in her twenties and criticised David Cameron as a “merchant of spin”. “I was a big binge drinker in my twenties. I started drinking at Oxford, being a party girl, and it got out of control. “I got a grip for a while, but in the mid-Nineties I was working in advertising and I would drink wine at lunch then go out and drink a bottle in the evening: most evenings really. I had no stop button. Ummm. He might be rethinking some more. It was so toe-curlingly cringeworthy that I couldn't read it through to the end. But perhaps the biggest absurdity is the proposition that New Zealand can and should catch up with Australia. Apart from the fact that Kiwis and Aussies speak the same language and have a historic affinity for each other, there is just no comparison between the two countries. Australia, for instance, has five times our population and 32 times our land area, an almost entirely different climate and is immensely richer in mineral resources. So how is it that in the past NZ ranked higher than Australia in per capita incomes? 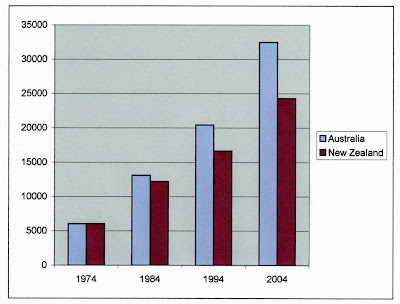 New Zealand’s GDP per capita was just ahead of Australia through the 1950/1 to 1966/7 – by around 5 percent. In effect the two economies were growing at the more or less the same per capita rate, the minuscule difference of New Zealand growing .2 percent a year perhaps being due to measurement error. In 1973 NZ joined the OECD. In 1974 NZ ranked 6th out of 26; Australia ranked 7th. The respective incomes were $6054 and $6020. But by 1984 Australia had pulled ahead by 8 percent;1994, 23 percent and 2004, 34 percent. As for the idea that a bigger population and land mass confers greater wealth per capita, tell that to the Chinese, the Indians, the Malaysians and Nigerians. Now that idea truly is an absurdity. The Families Commission is calling for Paid Parental Leave for fathers. A survey due to be released today paints a glowing picture of fatherhood and modern day paternal involvement, but, according to the Commission, even greater 'bonding' with newborns is required. It is commendable that many fathers in 2009 participate in the day to day care of their children to a greater degree than in past times. I am a big fan of fatherhood. But the extra fathering is not shared equitably across the board. A few decades ago men may not have routinely attended births, fed babies and changed nappies. But they did routinely support their families by working and putting a roof over their heads. In 1973 only 7.6 percent of families with dependent children had an absent parent. Today around 28 percent are headed by a single parent, usually a female. In 2008, more than 26,000 mothers received Paid Parental Leave. In the same year over 6,000 received the DPB as first time mothers aged 28 or less. Add in those older and those having another child and the number doubles. So probably as many as one in five new babies is not being financially supported by their father (except through Child Support). Not such a glowing picture. And while the survey finds that Maori and Pacific fathers were the most devoted, Maori and Pacific fathers are also the least likely to fulfil the role of breadwinner. Of the 6,196 first time mothers (aged 28 or less) who went on the DPB in 2008, 43 percent were Maori and 12 percent were Pacific. Assuming most, but not all, of the fathers of their children fall into the same ethnic group, Maori are extremely over-represented. So, Families Commission, what about a trade off? Paid Parental Leave for fathers who stick around, but no DPB - at least not as we know it now. If you are serious about encouraging active and enduring fathering getting rid of the DPB would be the single-most significant step you could advocate. Last week the release of the NZ Children's Social Health Monitor's latest report about the effects of recession provoked much angst and agitation for a stronger safety net for children. My response was that the recession isn't the problem. The DPB is. Here is one of their graphs. It illustrates my point very well. A plan to close the wealth gap with Australia is "too radical" for Finance Minister Bill English, who says bringing the two countries to economic parity by 2025 is an "aspirational" rather than realistic goal. So catching up with Australia is only an "aspirational" goal. Not a realistic one. What a losing attitude. Do the AllBlacks have aspirational rather than realistic goals? By the end of this week my entry (or more accurately, a photograph of my entry) into the biennial National Portrait competition is due. Do I want to win? You bet. There probably isn't a great chance given the high number of entries and the judge being an unknown quantity. But I went out and bought best quality canvas, re-stocked my paints and brushes, chose a subject close to my heart, studied it hard, took some chances with new colours and put in the hours. In other words I am doing what I have to, to be in with a chance - at the very least. I didn't say, well, despite getting into every competition since it began, I have never won, so why bother. Or, if I just keep on doing what I always do the result will somehow change. I am not asking people what they think and ignoring what they tell me. I hate having a mediocre, going-through-the-motions government. I am sick of Guy Smiley and his self-professed optimism. I heard him on radio saying I'm a glass-half-full kind of guy. Idiot. A glass half full is being filled. Our glass is half empty because it is being drained. NZ is not making progress economically and hasn't for a long time. What right does he have to refuse to act in the countries best long term interests? He can slum it with the best of them, side with the losers, molly coddle the moaners. But he's no leader. He's where he is in the polls because he isn't Helen. In 2025 I will be 66. I don't care about the f-----g super John. Put the bloody age up. What I care about is whether my kids and grand kids will want to live here, will be able to afford to live here. But if you believe achieving strong economic growth isn't a realistic goal the chances of that happening will continue to slip away. Crucial recommendations about the reform of working age welfare contained in the 2025 Taskforce Report must not be ignored, according to welfare commentator, Lindsay Mitchell. "The report says that far too many fit and able New Zealanders are receiving their income from the state, " said Mrs Mitchell. "This reduces New Zealand's productivity through loss of participation and contribution." "The authors have specifically recommended that the domestic purposes benefit have a 'absolute cut-off period' of 5 years. It observes that in many households parents work when their children are quite young, even when they may not want to. It finds no reason why those supported by the taxpayer should be treated more generously." "It goes on to detail the disproportionate growth in invalid and sickness beneficiaries and urges serious efforts to get people off these benefits and into jobs wherever this can be realistically and compassionately achieved. Interestingly the report does not mention reform of the unemployment benefit. That may be because the authors recognise that sickness and invalid benefits have become, to some extent, de facto dole payments." "The report's welfare recommendations are not out of line with what National campaigned on but have yet to deliver. The recommendations are not particularly radical and should be welcomed by all New Zealanders as the very minimum required to lift productivity and living standards to Australian levels by 2025." The next batch is due any day now. Mother is demented. Hissing and growling at anyone who even looks at her. I thought about taking her to the vet but considered that may cause her even greater stress, apart from which putting a possum in a box would be easier. This time, post birth, she will be whipped to the vet faster than John Key can say, no flat tax. But before we move on here are Jeffrey and Palangi now. I must say, as a dog person, these two have given us a great deal of pleasure. But there will be no more keepers! Fortunately four kittens are already spoken for. Let's hope Daisy produces to order. Department of Children and Family Services' internal log of 98 fatalities in 2009 (through early August) among children who had passed through the county child-welfare system. It was obtained by The Times and has not been altered, except for the deletion of children's names to protect families' privacy. In most cases, The Times was unable to verify the circumstances the log describes and has not corrected misspellings and typographical errors. The shooting of teenage boys figures very prominently. But what has this got to do with New Zealand? When New Zealand's suburban teenagers first began imitating the clothes, language and antisocial posturing of America's `gangsta' culture, they were laughed off as ludicrous, if unnerving, fantasists. Perhaps they still are, but 10 murders in two years, and a spate of vicious alcohol-fuelled assaults, have forced police to acknowledge they can cause a lot of harm. Has the situation improved? Counties Manukau police, MSD, the local council and public have put a huge amount of effort into tackling gangs. Let's hope it is paying off. For my part I am doubtful significant improvement will be achieved as long as the machinery for creating the dysfunctional families and kids remains intact. The number of people on the unemployment benefit is dropping, but numbers claiming the sickness and domestic purposes benefits are increasing at an alarming rate, according to Margaret Bazley, director-general of Social Welfare. She told delegates at a youth justice conference in Wellington last week that an extra 5,000 people a year were signing up on the DPB. Other stats from her speech: 268,000 NZ children live in welfare-dependent homes, 30% of children live in sole-parent homes, and 76% of children in sole-parent families were in the lowest income group. Former Finance Minister Ruth Richardson has been on the campaign trail to promote her political memoir, Making a Difference. She believes that NZ is suffering from policy paralysis. Her prescription: A dose of social reform including a six-month time limit on the unemployment benefit, the abolition of the domestic purposes benefit for those unmarried mothers who had not been in an established relationship, a rise in the age of eligibility for superannuation to 70yrs, a voucher system for education, and further privatisations including the sell-off of all state houses and health care. Ms Richardson doesn't believe her proposals would be difficult to sell politically, but "they would need leadership". Source - The Dominion 30 September 1995 "Cut dpb and limit dole, says Richardson"
Ruth was right. NZ is suffering from policy paralysis.